Scoots, the WhooNEW owl, is our friendly, wise and noble mascot. His precise binocular vision helps him spot the people, places and things that make his home in Wisconsin unique. His mission is to Discover the Best of Northeast Wisconsin and hoot and holler it out for all to hear. Scoots is a night owl and loves to keep his eye on the nightlife in Green Bay and the Fox Cities. But, if he’s not checking out the scene after dark, you could find him snatching a bite to eat, exploring area parks or using his acute sense of hearing to catch some local entertainment. Scoots is an adventurer at heart, and loves to take flights around the state exploring. 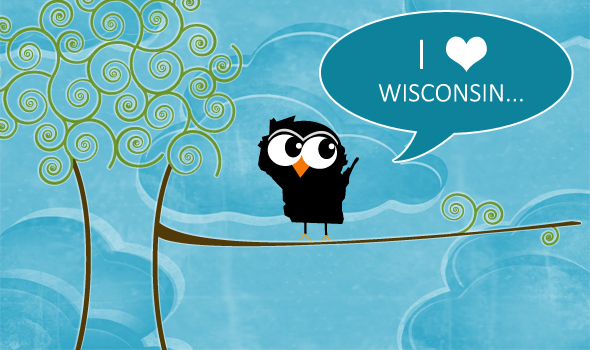 If you ever wonder where we find all these amazing stories about Northeast Wisconsin, we’ll tell you “A little bird told us.” That bird just happens to be an adorable little owl. Click to buy this I Love Wisconsin WhooNEW T-shirt! Check Out the WhooNEW Shop!